This week: Meat Loaf (or at least his lyricist) at a French restaurant in Washington - and God's gift museum. Larry Gelbart once said that if Hitler were alive and well he hoped he'd be out of town and working on a musical. There are worse places to be than Washington if you're enough of a masochist to become involved in one of these maniacal enterprises. The place is well endowed with cracking restaurants. It's bad bit is being holed up away from loved ones, etc, in a hotel. Washington is surprisingly underwhelming on the decent hotel front. No matter how efficient they are, business hotels are eventually depressing and soulless places, particularly over the holidays such as Thanksgiving when everyone has gone home. I was stuck in deserted Washington over the holiday last week, but my spirits were not too bad when I sauntered out of the venerable Willard Hotel bent on architectural recce. The residents had long since set off in record traffic jams to consume with their loved ones the second most boring meat to pheasant in the world, turkey. Breakfast had been disturbing. The language barrier between American and English is growing alarmingly. Underneath the list of omelets the menu proclaimed "Eggbeaters available on request." I was baffled. Other people's omelets looked perfectly cooked to me. Why would I need to order a wire whisk at the same time? I questioned the waiter who thought I was crazy. Later in the day I discovered that Eggbeaters are eggs that have had their yolks replaced by some man-made cholesterol-free compound. Anyway, we flew past the British Embassy in record time, which was just as well as close inspection of its utilitarian exterior reminds you of the BBC TV Centre and rain-soaked Inland Revenue offices. My first port of call had me gob-smacked. We in the theater sometimes get accused of merchandising too much. But the subterranean "gift museum" I encountered made the Disney store look like an amateur operation. There were models of singing hot gospellers for sale in red robes, there were fake medieval benches and carvings for your garden, everything from bird seed boxes to plants from the greenhouse next door, there were "mugs full of meaning" with improving quotations on them, key rings, videos about Mother Teresa, Coca-Cola machines, personalized gargoyles, jewelry amid themed zones with different piped music. I liked particularly "The Pastor's Study" from which emanated the Nutcracker Suite on an expensive music box surrounded by improving volumes and thousands of postcards. I was searching for a guide book in the gift shop of Washington Episcopalian Cathedral. Hats off to them, for keeping up this vast English Decorated style sham must be no mean achievement. I'm not trying to deprecate this undeniably impressive building. Yet it's surprising that so slavish a copy should have had at the outset the great G F Bodley as one of its architects. The best bits are the stained glass and the flowing sculpture in the tympanums on the west front. These works by Frederick E Hart have the fluidity of a contemporary G F Watts. Take in also the west rose window by Rowan LeCompte. This vast abstract rendering of the creation is among the best modern glass I have seen. The choir at Thanksgiving Day service gave a stirring rendition of Douglas Major's Te Deum. So, spiritually and visually nourished, it was time to nourish what occupies most of my waking hours, my body. 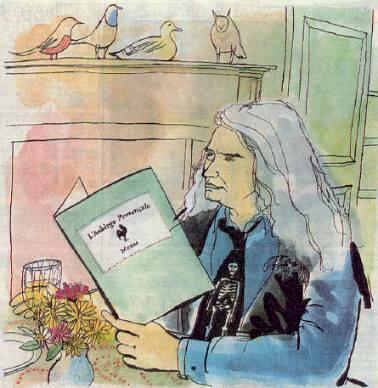 My lyricist colleague, Jim Steinman, had invited the dozen or more that were stranded over Thanksgiving to L'Auberge Provencal, which describes itself as a French country inn and is situated about 80 miles west of Washington in surprisingly unmanicured countryside. I don't need to remind as hip an audience as Telegraph readers that J Steinman is the man behind Meat Loaf, and I don't mean meat loaf as in the edible variety. From his pen has come some of rock 'n' roll's all time classics, like Total Eclipse Of The Heart and Bat Out Of Hell. He has long grey hair, wears only jeans and leather and has reputedly the largest collection of black skull-covered ties in the United States. So I can't fathom why the American rock 'n' roll press think that I and the "Prince of Darkness" (this is how Jim is known as he is not normally seen in daylight hours) might be curious collaborators. What they don't know is that Jim is a great wine and food connoisseur. The drawback to dining with him is that he orders everything on the menu. There's a rumor that when he plus his entourage (all serious rock stars must have a proper entourage) check into the Dorchester the staff automatically get a bonus. I once went to meet him there to encounter a traffic jam of food carts that made the queues on the M5 round Birmingham of a Friday night look puny. Jim had ordered everything on the service menu. Then there was the occasion at Montrachet in New York when he dined eight of us. He ordered all 16 starters. The waiter surprised, asked if he meant he wanted one of each. Jim paused, thinking deeply before acknowledging that the waiter had a point. He should have ordered eight of each. For this most generous of men does have a serious disorder; not an eating disorder, for he only pick methodically at everything and then pronounces about it with great authority. No Jim has an ordering disorder. Thanksgiving at L'Auberge Provencal was a relatively restrained affair with four wines and only 16 dishes - 18 if you count one which had a trio of roast venison in a delicious chanterelle sauce reduced with Madeira, a curious combination of rack of lamb in a Roquefort sauce and duck breast in a very American huckleberry effort. The only vaguely Provencal dish was aubergine with tomato and ricotta cheese. There was a very strongly smoked rabbit, so strong that it could have really been any white meat, in a delicious wild mushroom cream sauce with a little mustard. There was pumpkin ravioli with good moules mariniere. Why, you cry? Don't ask me. Lobster risotto was absolutely delicious if on the soggy side. But since people seem to have their Thanksgiving dinners any time from 11 am to 6 pm it must be impossible for a small place like this to time a risotto accurately. There was the darkest oxtail soup imaginable, of Gary Rhodes intensity. The inevitable turkey came with a most intriguing stuffing of oysters, chestnuts and buttermilk bread of some description. It lifted the dreaded meat considerably. The banquet went on, and on and on. Warm clementines arrived with a sabayon sauce. Delicious. Even this non-pudding man picked at a range of chocolate dishes, which actually brought the dish count to 20. There was a pumpkin cheesecake in a delightful cranberry coulis, and I forgot to mention best of all was a rock fish with crabmeat and lots of versions of sweetcorn from a corn sauce to some wonderful fritters. All this at $57 a head was an American, if not Provencal, reasonably priced feast. Head there if you're in those parts. They've just announced a "suite romantique" for Valentines day. Who knows? You might get snowed in at that time of year. Next week the man who wrote I'd Do Anything For Love (But I Won't Do That) and I will report on America's top rated restaurant in the Zagat guide. Watch out for a load of spice, a hint of fruit, the merest hint of longevity and a report of a meeting with the world's head wine arbiter, Robert Parker.